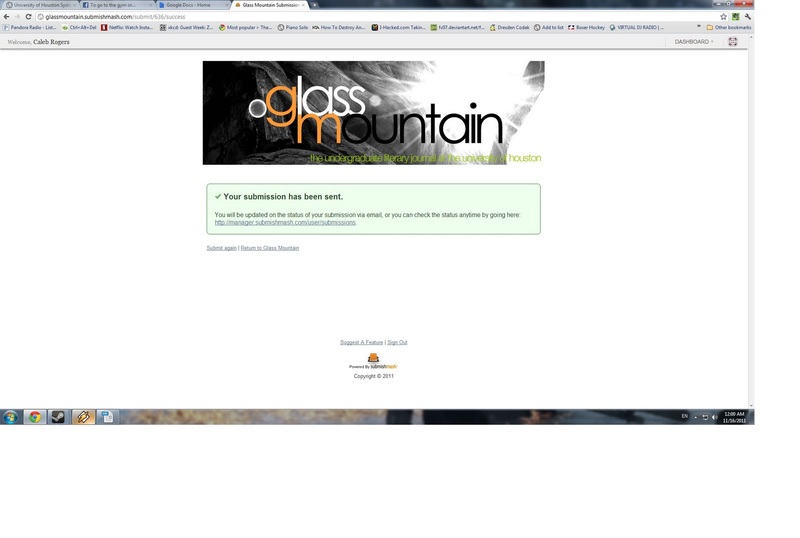 Finished a draft of "Dark Rocks in Space" in time to submit it to Glass Mountain today. It would be fantastic to get published, although I think the piece still needs a lot of work. It was really draining to blow-out revise the piece over the course of the last three days, and I definitely haven't gotten the work done in Japanese or Drama that I needed to. Hopefully I'll have time tomorrow morning to catch up a bit. This week is "Tech Week" for club theater. Every night we do multiple rehearsals of the entire show. It's actually helpful in terms of focusing: Attendance is mandatory, which means I'm nowhere near Skyrim. It has been hard focusing later, unless I'm at work or some other environment. I don't know whether it's post-China depression, early onset of senior-itis, or the easily available forms of instant entertainment cracking my ambition, but sometimes I'll waste a few hours doing something completely counter-productive. I can only hope I can turn this around before I wreck my semester with it. I also hope it's not already too late. The plays are pretty good, although the reiteration of last year's dinosaur play could use some work. Just need to get a bit more evil in the main antagonist (or, in this case, I guess protagonist) and it'll be perfect. One of the plays is tanking because the director disappeared halfway through the semester, leaving the cast members, well, directionless. My role isn't quite my favorite out of the roles I've had throughout my two years with club theater, but it's still fun. The show is thurs, fri, and sat at 7pm, which is fantastic because Josh and I are going to do Warrior Dash this Saturday. He promised he can get me back by 5pm, so I'll get to come on stage after having climbed through mud and fire. After that, cast party. Gonna be a great day. I was going to tape a camera to my head during the Dash for giggles, but they changed the theme from fire to water so I'd rather than destroy the thing. Speaking of cameras, I'm hoping to pick up the Canon Powershot ELPH 300 HS one way or the other pretty soon. Should be perfect for catching moments that are happening too fast for my uber-slow Galaxy S. If all goes well, it will also be the camera I take to Japan this summer. Kim is mad at me for keeping the window open all the time. Complains about humidity or something - I just like the smell of the enormous oak tree right outside. Saturday night we rappelled out the window using Jared's climbing gear, which was just about the best thing ever. Our downstairs neighbors were all playing Skyrim and seemed pretty confused as to why people were hanging next to their window by a rope. Skyrim is an amazing game. I might pick up a new processor to get Battlefield 3 up to working order and to allow me to bump up the settings in Skyrim to more fantastic levels. I've been stretching the game out by walking as much as possible, which really allows me to fully enjoy the ambiance and environments the developers obviously put a lot of work into creating. It's not like I have some sort of time limit - I can take as long as I want, so I shall.